Authors: Conan S., Derrien O., Aramaki M., Ystad S., Kronland-Martinet R.
This paper presents a physically inspired source-filter model for rolling sound synthesis. The model, which is suitable for real-time implementation, is based on both qualitative and quantitative observations obtained from a physics-based model described in the literature. In the first part of the paper the physics-based model is presented, followed by a perceptual experiment that aims at identifying the perceptually relevant information characterizing the rolling interaction. This experiment enables us to hypothesize that the particular pattern of the interaction force is responsible for the evocation of a rolling object. A complete analysis-synthesis scheme of this interaction force is then provided, along with a description of the calibration of the proposed source-filter sound synthesis process. A mapping strategy that enables intuitive control of the proposed synthesis process (i.e. size and velocity of the rolling object and roughness of the surface) is finally proposed and validated by a listening test. Previous studies proposed an intuitive control (i.e. coherent with human auditory perception) of impact sound synthesis, to create sounds by defining the sound producing object through verbal labels and morph between different impacted materials [1,2]. We want to extend these possibilities by proposing a control of the interaction with the sound producing object. The construction of the synthesis model is based on an action-object paradigm as proposed by Gaver . This paradigm assumes that the object’s and the action’s properties can be modeled separately before they are combined. Perceptual auditory information related to the object’s properties such as shape and material are contained in the object’s eigenmodes (i.e. frequency, damping and amplitude of each partial) and can be modeled by a well tuned resonant filter bank (we use the filter implementation proposed by Mathews and Smith in ). This is the filter part of the model. The source part of the model simulates the action by a well defined time-varying signal which excites the filter. This concept is schematized in figure below. Now, replacing the ball by a barrel. Source signal models based on a similar approach have previously been proposed for rubbing and scratching sounds. The perceptual differences between these sounds have been evaluated by the present authors in , in order to define a mapping strategy to propose intuitive control and morphing possibilities between these interactions. In these models, the source is considered as a series of micro-impacts. The aim of the present study is to propose a source model evoking the rolling interaction. To do so, we consider a physics-based model from the litterature , and especially the interaction force between the rolling ball the surface on which it rolls; this force carrying the perceptual information about the rolling interaction. This is investigated through a perceptual experiment. Then, an analysis-synthesis scheme of this interaction force is proposed based on the assumption that the interaction force is a series of micro impact. Such a model should be sufficiently generic to enable continuous transitions towards other types of interactions such as rubbing or scratching. High-level controls of the synthesis model are finally proposed for the ball’s size and velocity and for the surface roughness, and validated thanks to a listening test. Details on the Physics-Based Model proposed by Rath et al. where Xe is the vertical displacement of the exciter (the ball), and Xr the vertical displacement of each second-order oscillator; and the resulting sound is the sum of the contribution of each second-order oscillator. X is the penetration of the ball into the resonant surface, and the other parameters are detailed in the paper. Such a model can generate bouncing sounds as below. In order to adapt this nonlinear contact model to a rolling sound synthesis one, a dynamic offset signal is added to the distance variable x. 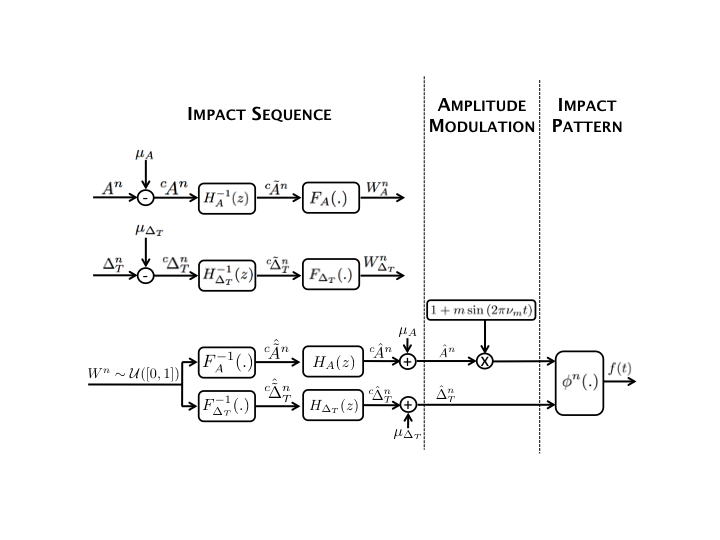 This signal, which is used to “feed” the impact model, is derived from physical considerations. Indeed, by considering the surface Sr on which the ball rolls as imperfect (i.e. not perfectly smooth on a micro-scale, as it is for real surfaces), one can assume that the rolling ball has a vertical movement along its trajectory and hits a certain number of asperities, depending on its size (e.g. the bigger the ball, the fewer the asperities and hence, the fewer the impacts). 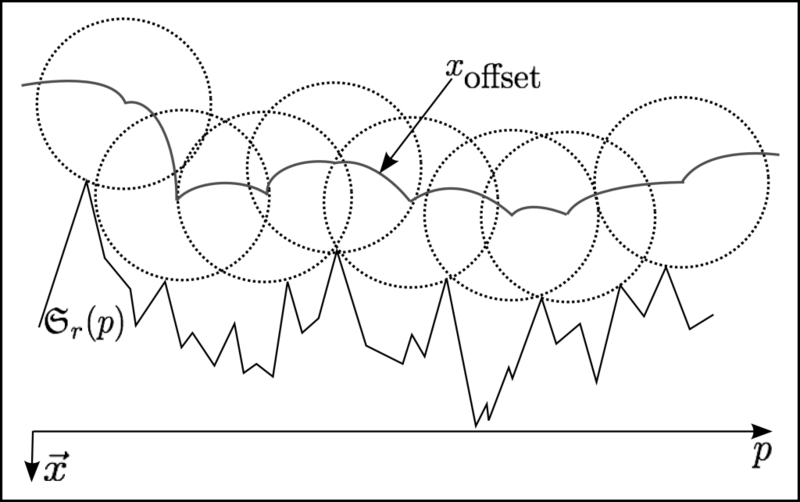 This vertical displacement (Xoffset) is added to the distance variable X, and is called the offset-curve (see the figure below). A listening test was performed to evaluate whether, depending on the chosen parameters, the interaction force alone can evoke the rolling interaction. Auditory stimuli are available here. The previous test revealed some combinations of parameters enabling the interaction force to evoke the rolling interaction. The raw force can be used as a source signal in our source-filter model. Hence, we propose a signal model enabling the evocation of rolling interaction, based on an analysis-synthesis scheme of the interaction force. As one can note on the figure below, the interaction force can be considered as an impact series. We propose to consider the interaction force with the formalism below. and Φ is the impact pattern (i.e. the shape of each impact). We propose an analysis-synthesis scheme that can generate forces as impact series by adjusting the statistics of the series of amplitude (A) and time intervals (ΔT) between impacts. The figure below illustrates the analysis-synthesis scheme. The impact model, and its dependence with impact amplitude, in the synthesis scheme is derived from physical studies [doel,8,9] and simulations. Note the amplitude modulation in the synthesis scheme, devoted to enhance the rolling object’s speed. Sound examples of the analysis-synthesis approach (no amplitude modulation is considered). In the soundfiles name, the label “V= ” is the velocity in centimeters per sec. One can note that the velocity difference between 2 sounds is poorly conveyed. Likewise the paper, when not varying, the parameters are κ=κ2, μ=μ2 and β=-0.5. Left column is the amplitude, right column ΔT. The sounds used during the subjective evaluation of the synthesizer’s mapping are available here. In the video, the “asymmetry” of the rolling object corresponds to the modulation depth “m” in the amplitude modulation (Equation (7) in the paper). This parameter is suspected to change the perceived asymmetry of the rolling object (this parameter is set to 0.3 in the subjective evaluation of the control strategy, Section VI). Based on a paradigm action-object, that assumes that the exciter (the ball) and the resonant surface are decoupled, we proposed a source-filter model for rolling sound synthesis. The source, carrying the auditory information about the interaction (to roll), is modeled thanks to the analysis of a physics-based model previously proposed , and the filter part, carrying the information about the resonant object, is based on previous work by Aramaki et al. , and is currently implemented using a resonant filter bank as proposed by Mathews and Smith . Some high-level controls such as ball’s velocity, mass and surface roughness were proposed and validated thanks to a perceptual experiment. The source modeling for rolling sounds synthesis is generic enough to synthesize other kinds of continuous interaction sounds such as scratching and rubbing, and we already proposed a control interface that allows to morph continuously between rubbing, rolling and scratching  (video demonstration available at: http://www.lma.cnrs-mrs.fr/~kronland/InteractionSpace/). M. Aramaki, M. Besson, R. Kronland-Martinet, and S. Ystad, “Controlling the perceived material in an impact sound synthesizer” IEEE Transactions on Audio, Speech, and Language Processing, vol. 19, no. 2, pp. 301–314, 2011. M. Aramaki, C. Gondre, R. Kronland-Martinet, T. Voinier, and S. Ystad, “Thinking the sounds: an intuitive control of an impact sound synthesizer,” in Proceedings of the 15th International Conference on Auditory Display, Copenhagen, Denmark May 18 – 22, 2009. S. Conan, E. Thoret, M. Aramaki, O. Derrien, C. Gondre, R. Kronland-Martinet, and S. Ystad, “Navigating in a space of synthesized interaction-sounds: Rubbing, scratching and rolling sounds,” in To appear in Proc. of the 16th International Conference on Digital Audio Effects (DAFx–13), Maynooth, Ireland, September 2013. W. Gaver, “How do we hear in the world? explorations in ecological acoustics,” Ecological psychology, vol. 5, no. 4, pp. 285–313, 1993. M. Mathews and J. Smith, “Methods for synthesizing very high q parametrically well behaved two pole filters,” in Proceedings of the Stockholm Musical Acoustics Conference (SMAC 2003)(Stockholm), Royal Swedish Academy of Music (August 2003), 2003. S. Conan, M. Aramaki, R. Kronland-Martinet, E. Thoret, and S. Ystad, “Perceptual differences between sounds produced by different continuous interactions,” in Acoustics 2012, Nantes, 23–27 april 2012. M. Rath and D. Rocchesso, “Informative sonic feedback for continuous human–machine interaction–controlling a sound model of a rolling ball,” IEEE Multimedia Special on Interactive Sonification, vol. 12, no. 2, pp. 60–69, 2004. F. Avanzini and D. Rocchesso, “Modeling collision sounds: Non–linear contact force,” in Proceedings of the COST–G6 Conference Digital Audio Effects (DAFx–01). Citeseer, 2001, pp. 61–66. A. Chaigne and V. Doutaut, “Numerical simulations of xylophones. i. time–domain modeling of the vibrating bars,” Journal of the Acoustical Society of America, vol. 101, no. 1, pp. 539–557, 1997. S. Monache, P. Polotti and D. Rochesso, “A toolkit for explorations in sonic interaction design,” Proceedings of the 5th Audio Mostly Conference: A Conference on Interaction with Sound, 2010. K. Van Den Doel, P.G. Kry and D.K. Pai, “FoleyAutomatic: physically-based sound effects for interactive simulation and animation,” Proceedings of the 28th annual conference on Computer graphics and interactive techniques, 2001.